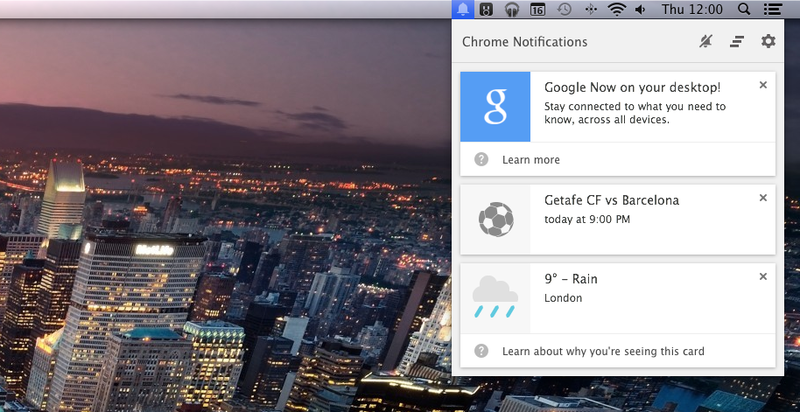 Google Now has arrived in Chrome Canary, the experimental version of Google’s desktop browser. While it’s been possible to enable the feature since April last year, this is the first time that it’s been possible to actually receive cards in the Notification Center. appears to signal that Google Now has been successfully integrated with the Notification Center in the Mac menu bar or Windows system tray. “Google Now on Chrome shows a subset of the Now cards you see on your mobile device, which uses your device’s location. Ever since the Notification Center was first spotted in Chromium – almost a year ago by Chromium evangelist François Beaufort – we’ve been expecting the arrival of Google Now on the desktop versions of Google Chrome. We expect it’ll be some time before the service is released in the official Chrome browser, or communicated officially to any of its users, but this is a huge milestone in the evolution of Google Now. Read next: No time to read? Blinkist wants to help.